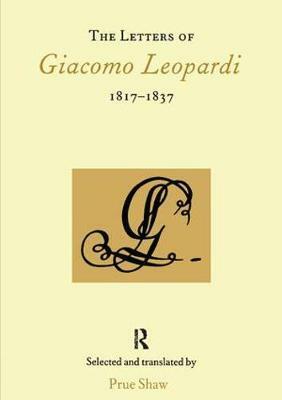 Giacomo Leopardi, Italy's great poet of the Romantic age, is the author of some of the most beautiful and best-loved poems in the Italian language and some of the most remarkable letters in European literature. The interest of the letters in both biographical and literary: they document the background - the difficult personal circumstances, the intense and troubled family relationships, the contacts and friendships with other writers - against which a haunting and compelling poetic voice came to maturity. The letters, not previously available in English except fragmentarily, are here offered in a new translation undertaken to celebrate the poet's birth in 1798. In the light of growing academic interest in Italy and the re-organization of many university courses in Italian along interdisciplinary lines, this book series brings together different scholarly perspectives on Italy and its culture. Italian Perspectives incorporates books and essay collections and is published under Maney's Northern University Press Imprint. It is notable for the breadth and diversity of themes covered, incorporating all aspects and periods of Italian literature, language, history, culture, politics, art and media, as well as studies which take an interdisciplinary approach and are methodologically innovative. The series welcomes books written in English and in Italian. The Italian Perspectives series is edited by two established scholars in the field of Italian studies, supported by an international Advisory Board.